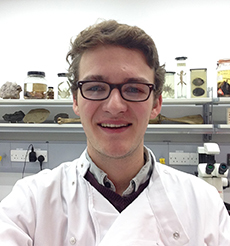 I am a currently undertaking a PhD studentship in the Molecular Ecology and Fisheries Genetics Laboratory at Bangor University, where I started in 2016. My interests revolve around the impact of anthropogenic pressures on fish species, with a focus on exploring these impacts using a range of molecular approaches and genetic tools. Run through Envision, the CASE studentship also allows for the continued collaboration between Bangor University and partners such as the Institute of Marine Research (IMR) in Bergen, Norway, whose state of the art facilities allow for the use of common garden experimentation in large teleost fish like salmon. In addition to the expertise of the CASE partners, the Envision group allows for the flow of ideas between a wide range of researchers, industry members, and NGOs. Previous to my PhD I worked on projects at the University of Bristol where I conducted my undergraduate and master’s degree, as well as at Cardiff University, in the city that I call home. These projects included the use of genetic data to uncover population connectivity in deep sea bioluminescent shark, and using whole-genome sequence data and Bayesian computation to better understand the population genetics of East African cichlids diverging in sympatry. Photo: Male Atlantic salmon (Salmo salar) - (Institute of Marine Research, Bergen). University of Bristol - MSci (Hons) Biology (2012 - 2016). First-class honours. 2014: “Gene Flow in the Deep: Population Structure in the Velvet Bellied Lantern Shark (Etmopterus spinax)” - Involved extracting, amplifying and verifying DNA from tissue samples using molecular techniques. Applied bioinformatics software to the resulting internal transcribed spacer (ITS) region and mtDNA sequences to uncover aspects of population genetics such as gene flow. 2015: “Insight into the demographic history of East African cichlids using Bayesian computation and whole-genome data” - Utilised whole-genome sequence data that was generated in a previous study. Implemented Bayesian computation and coalescence based simulations to this data in order to uncover aspects of population genetics in a group of East African cichlids related to Astatotilapia calliptera. This group of cichlids are diverging in sympatry within a crater lake located in southern Tanzania. As many global fish stocks are facing decline or collapse many fisheries are turning to aquiculture to meet their demand. Historically, aquiculture has lagged behind agriculture by an estimated 8,000 years, but in recent decades it has been rapidly catching up, especially in commercially important fish such as salmon. This shift has been observed both in the genetic and morphological composition of farmed salmon, yet an area of research that has not been thoroughly explored is the impact of aquaculture on the microbiome. With the implementation of next-generation sequencing huge progress has been made in discovering more about microbiomes, demonstrating that they play an integral role in the functioning of their hosts. 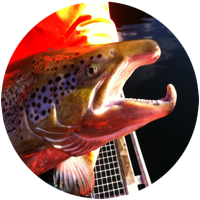 My project is combining the two contemporary issues of aquaculture and the microbiome, looking at the microbiome in farmed, wild and hybrid Atlantic salmon under common garden conditions. Other areas of the project will also look at both the external morphological characteristics of the salmon, investigating incidents of female mimicry in farmed male salmon, as well as how internal morphology and architecture of organs correspond to the composition of the microbiome. The project is based on a large collaborative venture between four international institutions, allowing for the utilization of both expertise and state of the art equipment involved in next generation sequencing, aquatic common garden experimentation and genetic analysis. 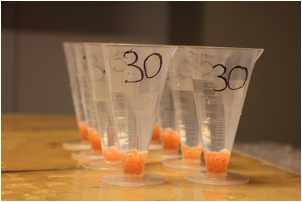 Photo: Salmon eggs - Ivar Helge Matre (Institute of Marine Research, Bergen).